Saturday – It got up to 39 degrees yet again, so we had brunch at the usual cafe then slept through most of the day or lay around under wet sarongs right in front of the fan, wishing it was a ceiling fan. We don’t know how to stop it turning so we get cool for a few seconds then have to wait for it to come round again – by which time we’re sweltering already. At the cafe an old lady came along selling little jellyish cake things that looked like fish roe to me. Gill was brave enough to try one and it turned out that they were a kind of chicken jelly with satay inside. They were tasty enough but the texture was pretty weird so we turned down offers of more from the cafe owners, bless them. Yesterday, we played tourists again and went on a trip out to Maeteman to an elephant camp. We woke up to thunderstorms and lightening and were a little worried that the trip would be cancelled, but it was still on. We jumped into a van around the corner and found we were sharing the trip with an Israeli couple on their honeymoon and a couple of young Danish guys. The elephant show was pretty cool. Elephants play football really well. They’re not bad at basketball either. I got to sit on top of one – they are so tall and broad and bristly! No wonder tigers think twice before bothering them. Their trunks are incredibly agile. Picture a strong, intelligent, hairy snake and you’re getting the idea of a close-up of an elephant’s nose. After a buffet lunch (where they had the mortal cheek to charge us for a drink of water and a can of Sprite!) we were shepherded down to the river rafts. We had to run the gauntlet through a bunch of Thai guys who took rather a fancy to the young Danish fellas. One of them approached the dark-haired one in a very flirtatious manner and the poor man had to duck and dodge while the Thai guys cracked up laughing. The river rafts consisted of two layers of bamboo, one on top of the other, and small benches thrown on top for sitting on. There were two drivers (or captains?) poling the raft all the way downriver. It was a really nice trip that went on for two kilometers, taking us past elephants, trees dripping with fruit, waterfalls, funky treehouses, and other visual delights. The front captain, an oldish but very spritely fellow, and I kept making crocodile jokes and the cheeky bugger told us he’d take us all the way to Bangkok for 200 baht each. When he threw water at my foot with his pole I told him he’d only get 180 baht if he didn’t behave himself (having honed my bartering skills nicely with all my market-going) but I have to say, I actually could have easily sat on that raft for hours and gone to Bangkok – to hell with our train tickets. It would’ve have been even nicer if the Danish guys hadn’t chattered and yakked and scared all signs of nature away all the way down. I think the honeymooners felt the same, but were too polite to say so. But what the heck, they were really nice guys, and they’ve recently been to New Zealand, so they obviously have discerning taste. Next stop was a Karen tribe camp (where the long-necked women live – them that have metal coils around their necks), but Gill and I sat outside and chilled while the others went in. We couldn’t bring ourselves to go and stare at a people zoo. We feel bad enough about doing it to animals. Then, onto the part I was really looking forward to, apart from the elephants – the Butterfly, Orchid and SNAKE FARM! 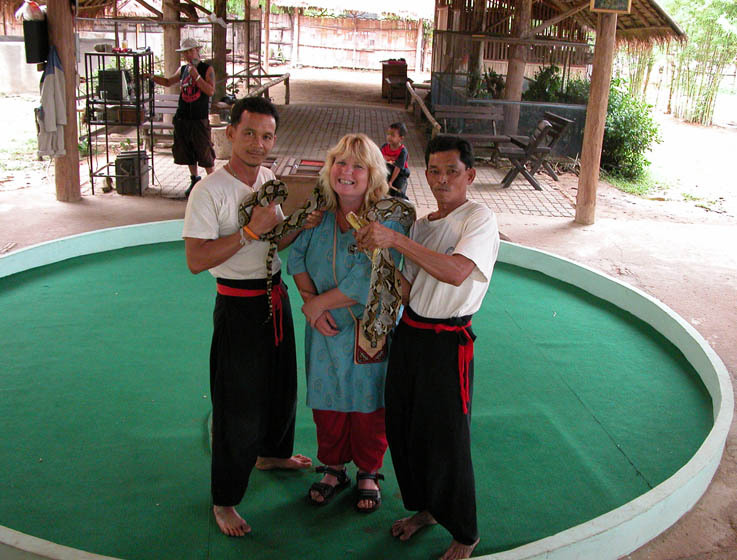 This has been my personal challenge – to go to a snake farm and touch a snake. There were only three of us at the show – me and the Israeli couple. I sat right in the back of the stands in case any escapism went on (yep, fraidy cat, that’s me). The show was short but pretty cool. It started off with a guy versus two cobras. The guy was very quick with his movements, but I noticed the snakes weren’t striking as quick as I thought they would, so I’m guessing they make sure they’re well fed first. After playing with his pets for a while, he milked one of its venom and showed us the fangs at close quarters. 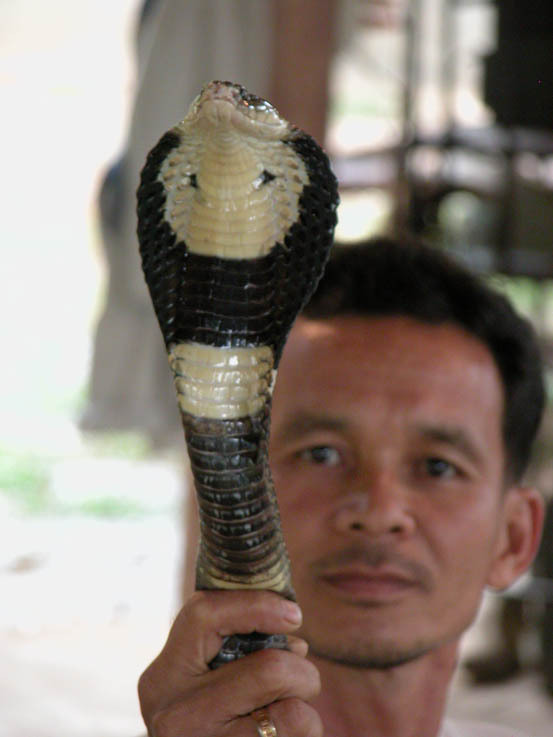 Then he brought one of the cobras up to where we were, blast him, and the emcee said that in Thailand if you touch a cobra, it brings good luck to you for the rest of your life. What to do? So I actually touched my first snake. The skin is very beautiful, I admit, but I’m not in any hurry to do that again. He played with a few more snakes, then the emcee announced the last part of the show – the jumping snakes. The guys reached into a box very gingerly, ducking and diving, then one of them got hold of a snake and threw it into the audience! I realised as he was doing it that it was a joke, but the Israeli guy kicked his bag off the stand in fright and his wife leapt behind him so quickly she was just a blur of movement. I nearly wet my pants laughing. Once the Israelis got over their fright they took the whole thing in good spirits, but the snake guys must have apologised about six times before they realised we were okay about it. Finally, they played around with a ‘young’ python, who, as a wee fella, was only six feet long or so. Then they challenged us to wear him around our shoulders. This I had to do. If once only in my life, I had to try it. It was about as creepy as I thought it would be. The snake was really heavy, I could feel it’s muscles constricting and moving along my back, and they were holding it’s face rather close to mine. Never will I forget the feeling of having a set of long muscles with fangs at one end on the back of my neck. The Israeli guy took a couple of photos of me and Mr Python and in the first one you can see the look of ‘eucchh’ on my face quite clearly. So I’ve decided to cancel my trek down the Amazon River as I just couldn’t handle one of those or an anaconda falling on me from out of a tree. I’m sure if that happened, they’d find me frozen stiff with a look of sheer horror permanently stamped on my face, should they manage to do an autopsy on said miscreant serpent. Blecchh. 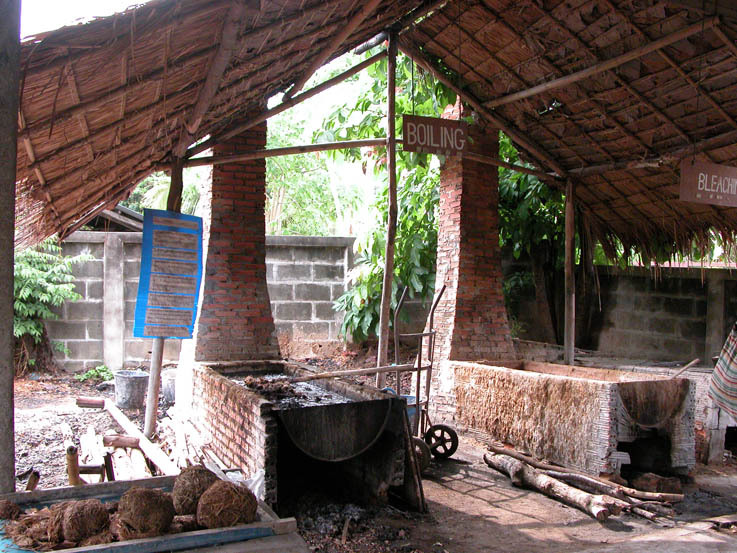 The final leg of the journey was to an elephant poo paper-making place. Enough said. Anyway, for the first time in ages, we were actually almost cold last night. The rain cooled everything down really nicely and it was rather odd not to be super hot. The frogs were croaking all over the neighbourhood – love songs apparently, as they have to mate really quickly while the temperature is down. I reckon there’s a few million tadpoles going to be born shortly, from what I could hear. It was cooler again today – only 36 degrees. Hanging out on our verandah as usual, we saw our cooking school teacher go by. Today is her 25th birthday. A guy from a few doors away walked past with his poodle, who thinks he’s a rottweiler, on a piece of string. Fat dog actually ran down the road this morning (we wiped our eyes and took another look! ), so we figured there must have been some sort of emergency, i.e. free food being handed out. Little dog followed after her, little legs blurring as he tried to keep up. Mama cat went by with a mouse flopping out of her mouth. Another successful family meal going down. Ratty Norvegicus (our chubby little neighbourhood rat) darted in and out of the art gallery pot plants then disappeared. Artist guy has been sawing and hammering all day. Twice I’ve asked him what he was making and twice the answer has been ‘dunno’. For a guy that doesn’t know what he’s doing, he’s pretty industrious about it. Mind you, we saw him watering his plants in the rain yesterday, so we’ve started to wonder about the state of his cerebral health. Tonight I watched a little frog hop across the road, have his leg stood on by an unaware pedestrian, just miss being squashed by a motorbike/sidecar and make it to the other side to be almost stood on again by artist guy. Then it turned around and started back across the road! Little dog spotted it and played with it right in the middle of the traffic, and then finally it found a hole and leapt down it, out of sight. Talk about nerve racking! Gill has just been feeding Mama cat and kittens secretly, over the side of the verandah, and it sounds like a party is starting up down the Rabbit Hole across the road. I’m off to find some liquid of some sort, as our respite from the heat is feeling like it’s over. It takes exactly 5 minutes for ice to melt in a glass of water here. Serviettes (napkins) in Chiang Mai cafes are either really tiny or they put toilet rolls into kitsch plastic dispensers and them on the tables. 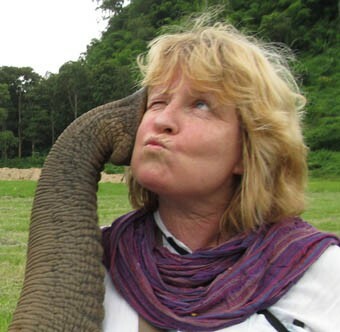 UPDATE: I have since returned to Thailand and volunteered in an elephant sanctuary – Elephant Nature Park, Chiang Mai. I learned there that the elephants that give rides and put on shows have a totally miserable life. Details of the sanctuary experience are in my later blog posts Elephant Nature Park. Please read these and opt out of going to these shows. Ask instead about sanctuaries such as the Elephant Park. The more tourists that do this, the more elephant owners and camps will change to a more ethical way of making a living with their elephants. Thank you. “Just take the photo, dammit!” Me trying to rid myself of my fear of snakes. It didn’t work – I still think they’re creepy. In which elephant pooh is transmogrified into paper. This entry was posted in Ravings - random wafflings, Ravings on Thailand and tagged Chiang Mai, elephant, frogs, Market, river rafting, snake, Thailand. Bookmark the permalink.